Brazilian Blowout Review: Can You Really Tame Those Unruly Locks? Does Brazilian Blowout Really Work on Unruly Hair? If you’re constantly doing battle with your hair, you might be considering Brazilian Blowout as the solution. It bills itself as the world’s best hair smoother, doing it’s thing on frizzy and unruly hair so that you can have that smooth and tamed look. Some of us were born with naturally straight hair, and others not so much. Those with unwanted curls, waves, and frizz will constantly be looking for the next best product that actually works. So let’s look at this more closely and see what it’s all about. Hair is interesting because it seems like the grass is always greener on the other side. People with straight hair want curls, those with curls want it straight. If you’ve got thick, curly hair you probably end up with more bad hair days than good, and something like Brazilian Blowout hopes to flip this statistic around. The claim by Brazilian Blowout is that their latest product, Zero contains no formaldehyde that is typically used in other straighteners out there. They say that this new formula is easier to use and can be left in the hair. They say that it takes just 60 minutes to see results. They say that this has all been developed in house, and it involves the use of amino acids, and a special bonding system that allows it to last up to 3 months. By working in just one hour, and requiring no down time, they are pretty much putting themselves on the map when it comes to hair straightening solutions. Quick, name another product that makes these same claims. They go on to state that Zero deep conditions the hair, so you won’t have severely damaged hair just to get it to behave itself. It will also give it shine so it looks good and touchable. It’s actually improving the health of the hair, instead of frying it into submission. They also claim that you can use after care products that will extend the life of the treatment so you don’t have to get it done as often. The hype comes from just how frustrated people get with hair that just won’t do what they want it to. This makes them desperate for a product that will help them out and give them the look and the style they want. Anything that shows a hint of success will get a lot of attention, and a lot of expectation placed on it. They have several different products, all at different price points. To put it in perspective, a bottle of their anti-frizz shampoo can be found for around $45, and that’s for a 12 ounce bottle. Other products can be bought at the salon, and will vary in price by demographics. You have to either commit to visiting a salon and having someone do this for you, or trying to get it right on your own with their home-based products. You can also do a mixture of the two, get the professional tips in the salon and then just do what they said to do on your own. This is the way we’d go about it if there’s a location near you, because you get the best of both worlds, professional styling but do-it-yourself prices. 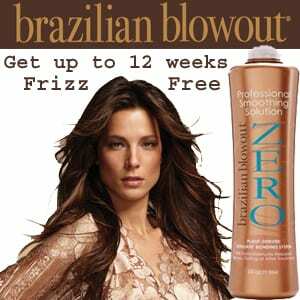 They are doing a lot of things right over at Brazilian Blowout. One of them is that they’re not just content to rest on the success of just one product. They’ve improved on their original product with a new one called Zero. This is claimed to have even more straightening ability than their first offering, but they’ve made it easier to use, and even more effective. A lot of companies will get one product right, and then be happy with the sales they receive from it. A company that improves on itself is showing that it’s here for the long term and wants to keep its current customer base happy. We’re giving the nod to Brazilian Blowout and recommend trying it out if you have yet to find anything to tame your hair, or at least get it to cooperate a bit more. Even if it only works a fraction of how well it seems to, it would still be worth it. You can even visit a salon near you and get professional styling tips that you can do in your own home. A product like this that blends the real world into the ordering process is unique. Most companies are not sure enough of their product to put it in an actual salon, and rely on online ordering alone to sell their wares. By putting a face to their product, they are basically backing it up with actual representatives, which is pretty impressive, and makes it likely that they’ll be able to get your hair the way you want it. When you give this a try it’s best just to have fun with it. Take your own before and after pictures so that you can see the difference. Be an objective observer and see what sort of results you get. Our hair can either be the source of a lot of stress and frustration, or it can be a lot of fun, like we’re the doll that is getting a new hairdo. If you’re the kind that has to get in a daily wrestling match with your locks, and if they usually win on most days, you might want to think about giving this a try. What do you think? Does Brazilian Blowout work or not? I settled a lawsuit with GIB insurers a few months ago. I used the treatment ONCE by a certified Brazilian Blowout salon that Brazilian Blowout recommended on their website. My attorneys had their products tested…they are LOADED with formaldehyde. There is 5 – 7 times MORE formaldehyde in the products than EMBALMING SOLUTION. I was allowed to fast track my case because it is reasonable to think I have less than 6 months to live. The product is inhaled and ABSORBED. Because my hair was so amazing thick and long…every time I layed on my hair I was absorbing it into my scalp, neck, face, skin. Everytime I took a shower the heat reactivated it and again the process started. The sun would continue to allow my hair to off-gas by the heat. The vomitting, the bathroom trips, the ER trips, urgent care visits…and no one could figure out what was wrong because the medical field refused to believe that any company could ever make a product with that much formaldehyde…even after I showed them OSHA tests. Two months later I had my hair tested. It was STILL over the legal limits of formaldehyde. After the certified industrial hygenist left, I shaved offed the remaining hair I still had and sobbed. I then looked in the mirror and laughed and said to myself that only my deceased father, Anthony Casamento, a Congressional Medal of Honor recipient, would be able to look at me in this horrorible state and still think I was beautiful. To bring you up to date without boring you with all the details…I do plasma phoresis for 4 hours three times a week (blood exchange), I have had blood transfusions, two four inch tubes stick out of my chest and are attached to my heart and neck to push my blood through. I have liver and kidney damage, eye,ear, nose problems. My BRAIN and thyroid have attrofied, my DNA changed, I have had blod clots, I have 6 autoimmune diseases, and my life is cut short. If you have any symptoms of headaches, unexplained tiredness, very mild to severe flu like symptoms which don’t seem to completely go away since you had the Brazilian Blowout please get yourself checked out. I have been to the top hospitals in California, and it took me almost 8 months to find a treatment. I wish someone would have told me two years and three months what I now know. It could have saved my life. You can do blood tests for CO2, methylene glycol, ehtylene glycol, kidney function, and acid levels–these levels will be high. These are simple blood tests which are covered under most insurance and can be performed at a doctors office. The tests can also be done at an urgent care, hospital, clinic, etc for those who have different type of insurance or state subsidized insurance. You need to get rid of any pillows, bedding, towels, etc. that have come in contact with you hair. You need to have your babies checked by a doctor for the same blood tests that you are doing. They are inhaling and absorbing it and they can’t tell us…and your normal doctor is NOT going to realize the necessity to do this, but you need to know that you are continually off-gassing everytime they are near you or lay on your pillows. I was known for my amazing mane of hair–-it was my identity and my favorite part of me. After I lost my hair, I realized in time, that it wasn’t my hair that made me beautiful, it was me.